Saturday temps may not break above 21°C and could flirt with or set a new record low daytime maximum for the date. Saturday temperatures, which reached the 30s Celsius just a week ago, may struggle this weekend just to reach 20°C. A reading below 20.6°C would set a new record for the lowest maximum on the books for July 27. The previous record this date was set in 1981. Wednesday I wore a polo and jeans, and shivered on the way home from work. Yesterday I wore a long-sleeve shirt that I rolled up most of the day. Today I'm back in a polo and blowing on my hands to keep warm. That's the most interesting thing about anthropogenic climate change: even though the planet gets warmer, local weather may be cooler—and more extreme. Chicago has a much larger and more diverse economy to draw from to address its debt concerns. A report from the federal Bureau of Economic Analysis released in February shows that Chicago metro area GDP in 2011 was $548 billion annually, making it the third largest in the nation after New York and Los Angeles. That makes the Chicago economy nearly three times larger than Detroit's, which checks in at $199 billion. Chicago's economy is also more diverse than Detroit's, with no one industry sector making up more than 13 percent of the metro area workforce. Chicago's economy also enjoys demonstrated strengths in areas where Detroit is weaker — specifically, finance, transportation and warehousing, and education. There is simply a broader and deeper reservoir that Chicago can tap. Perhaps more important, there are key historical differences that led Detroit to bankruptcy but kept Chicago on a growth path. Circa 1950, Chicago and Detroit were mid-century manufacturing doppelgangers — economic powerhouses teeming with industrial businesses, each with a bevy of skilled and unskilled workers to employ. However, governance differences caused their paths to diverge. Mayor Richard J. Daley is often remembered as the quintessential machine politician, but he cut his political teeth in fiscal policy before occupying the fifth floor at City Hall. He put that expertise to good use while in office. Also, the dozens of municipal corporations and special-purpose districts here, lacking in Detroit, meant the fiscal burden could be spread around. As a result, City Hall ends up having fewer direct responsibilities and a slightly rosier fiscal picture. When Detroit doubled down on flinging its population into the suburbs in the last half of the 20th century, Chicago cleaned up. I remember the smog, dirt, and crime of the 1980s vividly—and the stunning clean-up in the 1990s. During the same time, Detroit emptied out even more. Detroit shows just about ever method available for killing a city; Chicago shows the opposite. Urbs in horto is a reality. Our company needs a specific Microsoft account, not attached to a specific employee, to be the "Account Holder" for our Azure subscriptions. Azure only allows one and only one account holder, you see, and more than one person needs access to the billing information for these accounts. Setting up a specific account for that purpose solves that problem. So, I went ahead and set up an email account for our putative Azure administrator, and then went to the Live ID signup process. It asked me for my "birthdate." Figuring, what the hell?, I entered the birthdate of the company. Annoying, but fine, I get why they do this. By the way, those screen-shots are from the third attempt, including one giving them a different credit card. I have sent a message to Microsoft customer support, but haven't gotten an acknowledgement yet. I think I'm just going to cancel the account and start over. Update: Yes, killing the account and starting over (by denying the email verification step) worked. So why couldn't the average pre-teen figure this out too? This has to be one of the dumber things companies do. Building owners have the authority to prohibit people from entering their property with a concealed firearm. To exercise this right, building owners “must post a sign . . . indicating that firearms are prohibited on the property.” Signs that say the carrying of firearms is prohibited must be “clearly and conspicuously posted” at the entrance of a building, premises or property where it is prohibited. The Illinois State Police is charged with adopting rules and standards for these signs. Building owners should also consider the implications of posting signs. If they prohibit firearms and then do not enforce the rules, are they opening themselves up to additional liability? Do landlords want to prohibit the concealed carrying of firearms on their property and in their buildings? If they do, then they should consider what policies to adopt and where to post the signage to prohibit it. Landlords should review their standard lease rules and regulations to ensure that they implement the concealed carry policies. Even though Illinois is the last state to permit concealed carry of firearms, the new law may be a good opportunity to review standard lease provisions in other states. The author also talks about how the new law affects bars and third-party property managers. But think about this: in one of the most advanced countries in the world, in the 21st century, we have to put up signs to prohibit armed people from entering. You know, I recognize the necessity of having armed police on the streets. I submit that allowing everyone else to carry guns will make us less safe, both from the guns and from the police response to having more guns around. Posting might be a bit slow this week as I'm helping a second project meet a deadline while my own project has a deadline only slightly farther into next week. Oh, and if anyone knows why .NET has trouble consuming Siebel web services, I could really use some suggestions. Three weeks ago, I visited San Francisco. Two days after I flew out of SFO, there was the first fatal air-transport accident in the U.S. in 12 years. The front landing gear of a Boeing 737 operated by Southwest Airlines collapsed upon landing at La Guardia Airport on Monday evening, thrusting the plane’s nose into the tarmac and sending out a stream of sparks as the plane skidded to a stop, officials and witnesses said. At least  people were injured, according to the Port Authority of New York and New Jersey, which operates the airport; six of those were taken to Elmhurst Hospital Center. The extent of their injuries was not immediately known, though it appeared that none were serious. The airport was closed for about 80 minutes, and one of its two main runways reopened at 7:06 p.m.
All the injuries were minor. Good thing I'm not scheduled to fly anywhere for five weeks. As late as 2005 or 2006 — that is, until the eve of the Great Recession — you could argue that there wasn’t a whole lot of difference in aggregate performance between greater Pittsburgh and greater Detroit. Obviously, however, Detroit’s central city has collapsed while Pittsburgh has had at least something of a revival. The difference is really clear in the Brookings job sprawl data (pdf), where less than a quarter of Detroit jobs are within 10 miles of the traditional central business district, versus more than half in Pittsburgh. It’s hard to avoid the sense that greater Pittsburgh, by taking better care of its core, also improved its ability to adapt to changing circumstances. In that sense, Detroit’s disaster isn’t just about industrial decline; it’s about urban decline, which isn’t the same thing. If you like, sprawl killed Detroit, by depriving it of the kind of environment that could incubate new sources of prosperity. The New Republic weighed in with five startling maps that show exactly what happened along five key metrics. Over 20 years, the city lost 60% of its population (even while its suburbs increased theirs), and only the poorest people seem to have stayed, driving down the city's income at an even faster rate. With fixed infrastructure to support 1.8 million residents, the remaining 700,000 can't generate enough tax receipts to fund the city's commitments. Bankruptcy was inevitable given these circumstances. Lots of things killed Detroit, but most of these things were policies and decisions that favored wealthy, white suburbanites over poorer, black city dwellers. Chicago has experienced its first big heat wave of the year, with temperatures above 32°C every day this week. 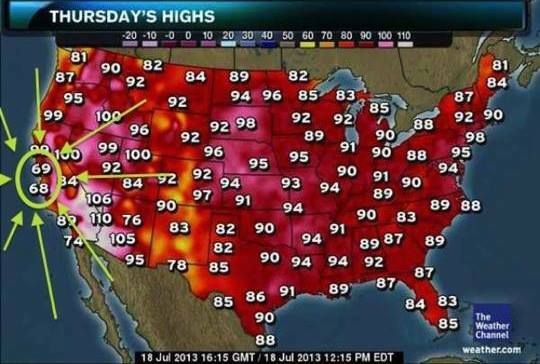 Yesterday, 46 of the lower 48 states reported temperatures in that range, with only North Dakota and Minnesota spared. A friend who lives in San Francisco posted this with the caption, "Summer hits the Bay Area:"
It cooled down last night, so it's now just about 26°C...here. Only I'm going to New York in a few hours, where today will not only get to 35°C, but will have violent thunderstorms and buckets of rain. Good weekend to visit. Two weeks ago, I described my experience zipping through SFO's security lines. Because I have elite status on American Airlines and because I'm in the CBP's Global Entry program, I qualified automatically for TSA PreCheck. Until now, travelers could only apply to use PreCheck if they were members of certain airline frequent flier programs or were enrolled in "trusted traveler" programs with the U.S. Customs and Border Patrol. The expansion is part of the TSA's efforts to focus more attention on high-risk travelers and cut back on the screening time spent on frequent travelers. Travelers who pay the $85 must submit to fingerprinting and a background check. Applicants who are cleared by the TSA are enrolled to use the PreCheck lines for five years. I'd say it's worth $85 to get through security lines at speeds not seen since the last century. Anyone who's paid attention to this blog knows I've gone to most of the ballparks in the country, Wrigley Field most often. As much as I love the place, Wrigley's age shows. I mean, poles, for crying out loud. So, OK, the park needs some freshening, but on the inside. It does not need all this crap. With a unanimous vote at a hearing this afternoon, the Plan Commission moved the Cubs past one of the final hurdles before the entire project heads to the City Council for a vote, which could be on July 24. The commission gave the Cubs the green light on construction of a plaza in its adjacent triangle property, a six-story office building and a boutique hotel across the street. The plan includes a pedestrian bridge over Clark Street and a main hotel lobby entrance facing Patterson Street as the team had planned, but the Cubs have "deferred" a planned patio deck over Patterson and hope to revisit the idea at a later date. With the Alderman on their side, the last remaining roadblock to the Cubs' plan could be the Wrigleyville Rooftop Association, which continues to threaten a lawsuit if their views are blocked by outfield signage that was approved last week. The park has nothing to do with the team sucking like a Dyson; the bad playing does. I have no idea why Tunney is letting this go through or why Ricketts thinks he needs to build this. Wrigley's biggest draw is its history. Ricketts and Tunney, who have attention spans only slightly longer than Parker's, can't understand this.